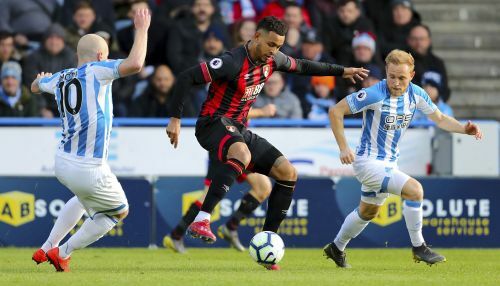 HUDDERSFIELD, England (AP) — Callum Wilson scored on his return from a knee injury as Bournemouth ended a nine-game losing streak in English Premier League away matches by beating last-place Huddersfield 2-0 on Saturday. Wilson was back from a seven-week layoff and opened the scoring in the 20th minute by chesting the ball into the net. Ryan Fraser doubled the lead in the 67th. The loss nudged Huddersfield ever closer to relegation after a 15th loss in its last 17 league games left it 16 points from safety with just eight matches to play. Wilson has six goals in seven appearances against Huddersfield and 11 in the league this season after he met a cross from Fraser at the far post and chested it home. He turned provider for Fraser for the second, cutting the ball back for his teammate to sweep home from six yards. The win kept Bournemouth in 12th place, level on points with 11th-placed Everton.